This species is very similar to the common grass yellow, which I also saw in India. There are several other species too, which I didn't see. 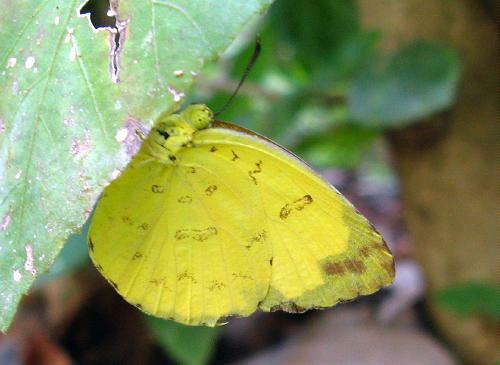 The characteristic of three-spot is, as its name suggests, the three spots visible in the underside cell of the forewing when the butterfly is at rest, as in the picture above. Grass yellows are small, restless creatures that I often saw along hedges, ducking into the grass or foliage beneath the hedge then soon emerging and flapping off somewhere else.